He might still be waiting on his first win as Coleraine manager, but Rodney McAree was full of admiration for his side following Tuesday night's 2-2 draw with Ballymena United. The Bannsiders looked as though they had a mountain to climb as they trailed their derby rivals 2-1 and were down to ten men with a half still to play. Darren McCauley celebrates his Showgrounds screamer. 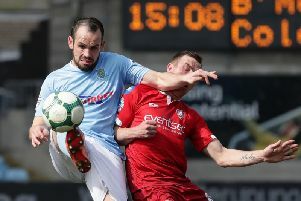 The Sky Blues looked as though they were going to run away with things after an impressive first half, and Eoin Bradley's early dismissal only compounded things for the hosts. But a good team talk at the break galvanised Coleraine and they kept themselves in the game long enough to get something out of it much to McAree's delight. "Coming off difficult game against Linfield on Saturday, and going down to ten men after 16 minutes is extremely difficult, especially as there was a few tired legs knocking about after the weekend," he said. "For the guys to dig in like they did and keep themselves in the game for as long as possible to give them an opportunity to claw something out of the game was special. "We want three points, we need three points if we are going to achieve something we have to start picking up wins, but after the sending off so early in the game you would have taken a point at that stage. "There's a never say die attitude within the dressing room, which I'm very fortunate to have been thrown in to. "It has been instilled in that dressing room over years of hard work, and it's paying off now. "You look at some of the guys in there - Ciaron Harkin in the middle of the park, Stephen O'Donnell at the back - these guys never say die, they don't know when they're beat. "It's great and I'm very proud to be part of it."